Filmed live at London’s Bridge Theatre during its limited run, don’t miss Alan Bennett's ‘rousing chorus line for the NHS’ (Observer) in your local cinema. The Beth, an old fashioned cradle-to-grave hospital serving a town on the edge of the Pennines, is threatened with closure as part of an efficiency drive. A documentary crew, eager to capture its fight for survival, follows the daily struggle to find beds on the Dusty Springfield Geriatric Ward, and the triumphs of the old people’s choir. 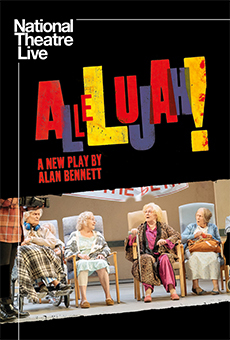 Alan Bennett’s celebrated plays include The History Boys, The Lady in the Van and The Madness of George III, all of which were also seen on film. Allelujah! is his tenth collaboration with award-winning director Nicholas Hytner. Please note, this production includes strong language throughout. The Bari Lipp Foundation has generously offered free tickets to seniors and students for all Live Met, Bolshoi and National Theatre events. Free tickets are ONLY available in person at the box office. You may get them either in advance or the day of the event. For free passes for large groups ONLY, you may also call our offices at 508-332-4822 ext 106.